My love for lemons. I love using lemon juice and zest along with fresh herbs in my recipes. Why? Because it’s a great way of boosting flavor and nutrition without having to use heavy ingredients like butter. Lemon juice will provide some vitamin C while fresh basil has everything from vit. E, riboflavin, niacin, fiber and a lot of more stuff. I am a pasta lover… I think I might have been an italian in another life because I could live off of breads, imported cheeses and pasta. 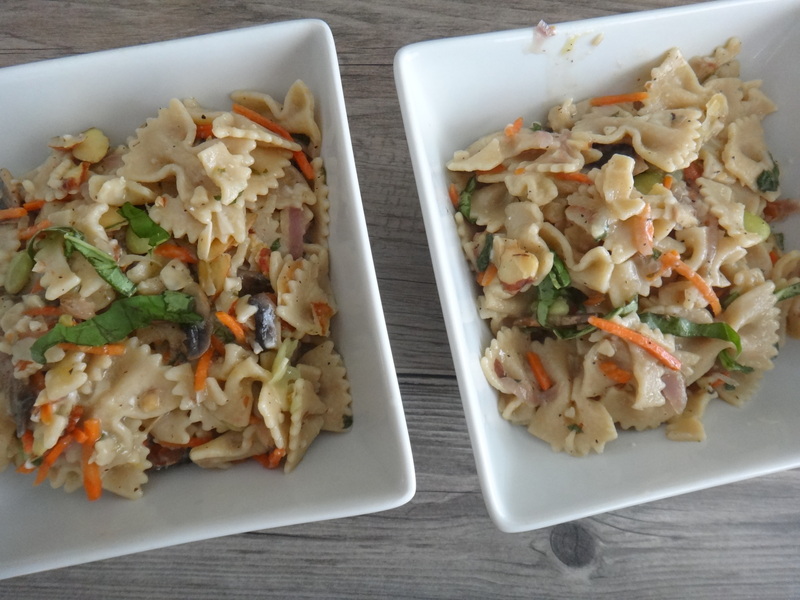 If only they were more healthy….Well, luckily for you…this is were my blog comes in..I’ve made it my mission to make savory, healthy dishes that you can both feel good about eating and enjoy. This pasta dressing is my go to light sauce. It was adapted from my favorite chef Giada di Laurentiis. I love her recipes! However, most of her dishes have lots of butter and parmesan cheese. I can’t blame her it tastes delicious, but my recipe leaves you with a guilt-free conscience after. So what did I do? Eliminated the butter and cut the parmesan in half. There is no reason for using diet cheese; when real cheese is used in moderation – its taste goes a long way. 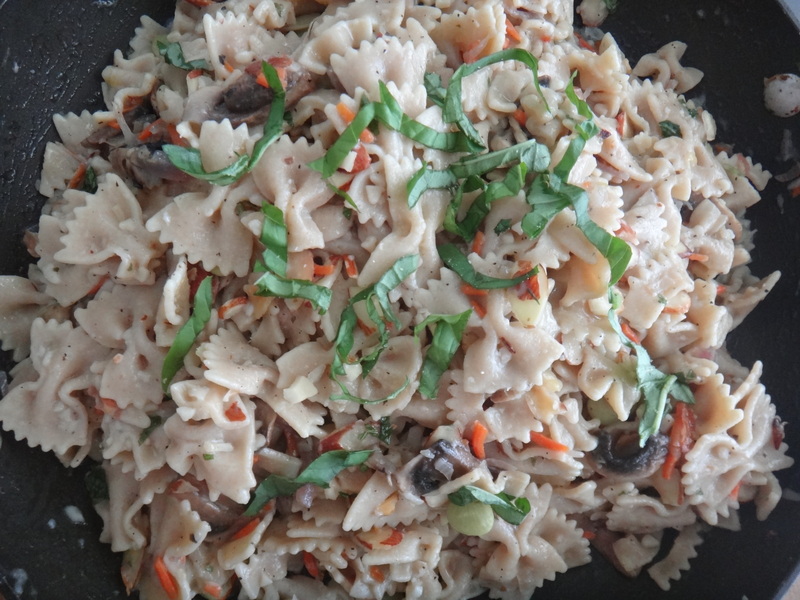 I recommend using a good quality parmesan cheese for the recipe because a small amount infuses the entire pasta. Mmmmm. It’s so good. 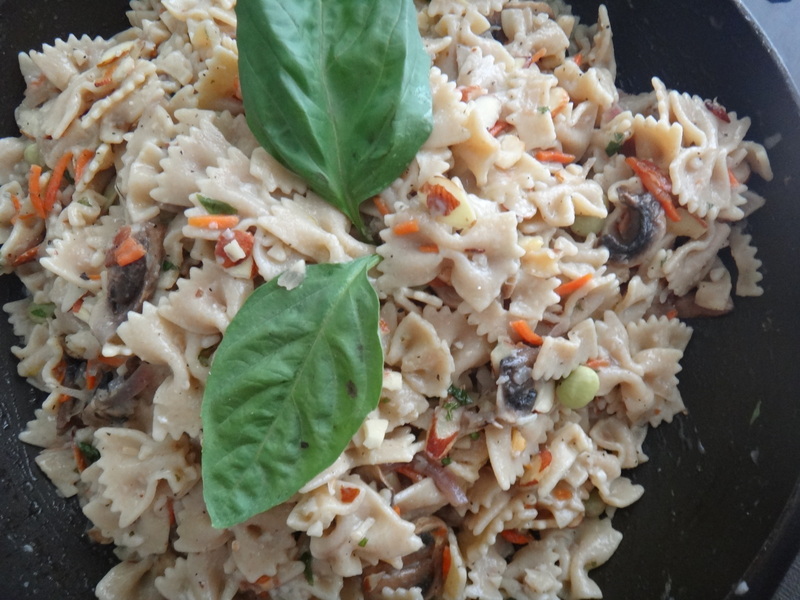 And the best thing is that this pasta can be eaten warm or straight from the fridge the next day. – Extra virgin olive oil: when using this to replace butter it can help lower cholesterol levels. Additionally it contains polyphenols and antioxidant that also helps protect blood vessels from deterioration and damage. – Almonds: just a handful can add heart healthy qualities to your dish. Besides containing sterols, fiber and “good” fat, it may also help you lower LDL cholesterol (the bad kind) and reduce your risk of developing diabetes. – Carrots: besides being a good source of vitamin C and K, carrots may help maintain a steady glycemic index and reduce your risk of developing diabetes. It’s also an excellent source of soluble fiber, which makes it a powerful cholesterol fighting food. – Lima beans: are a great low fat/low cholesterol protein source. They are a great source of dietary fiber, vitamin C and manganese. Now remember just one dose won’t save you. You need to implement this kind of ingredients into your everyday diet for a long term protection and disease prevention. 1. 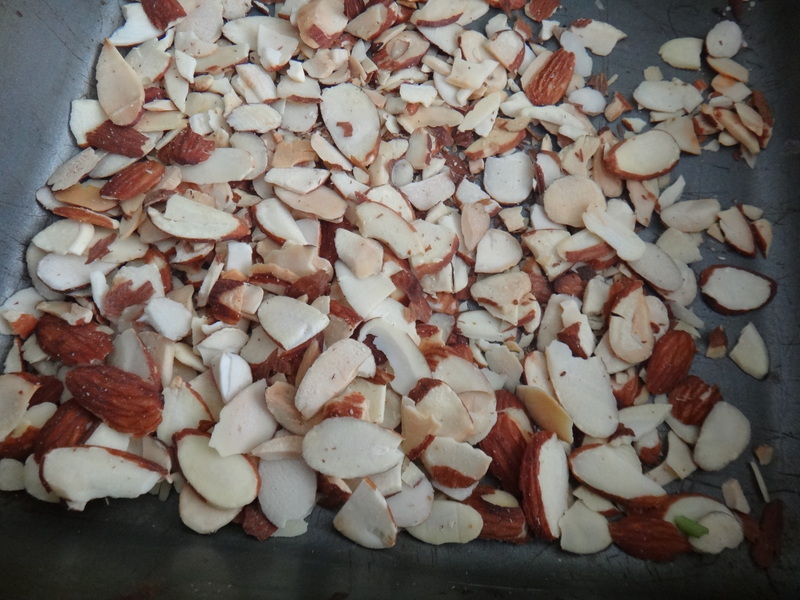 For a more aromatic pasta, bake the sliced almonds (or walnuts) in a preheated 350ºF oven for 6 to 8 min. Remove when you see the nut pieces beginning to brown. Dice the garlic cloves. Reserve half for the vegetables and use half for the dressing. Whisk all of the dressing ingredients in a small bowl. It may look a bit thick but remember you are going to add 1 cup of pasta water later on. 3. Boil lightly salted water and cook pasta until tender. 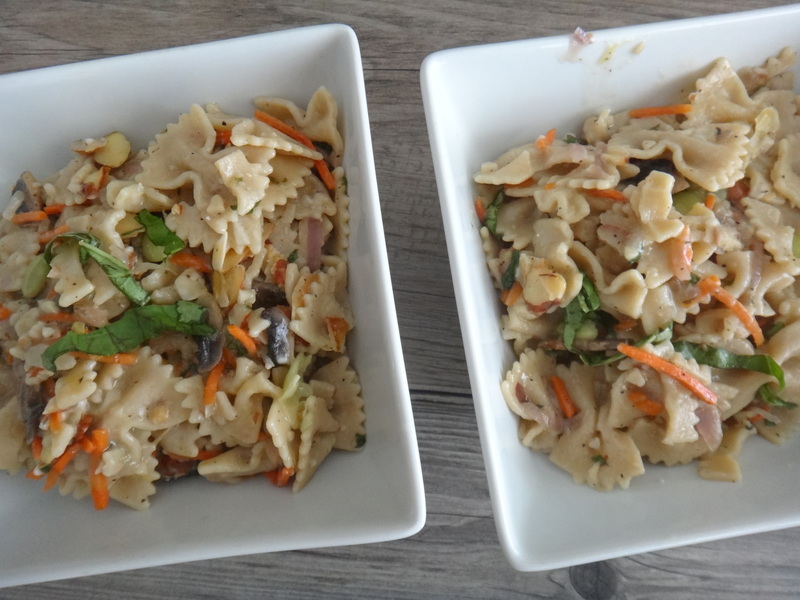 Whole wheat pasta can take a bit longer than usual to cook, from 8-15 min. Drain and RESERVE 1 cup of the COOKING WATER for the PASTA DRESSING. *TIP: You could place a bowl under the colander when draining the pasta in order to reserve this water. 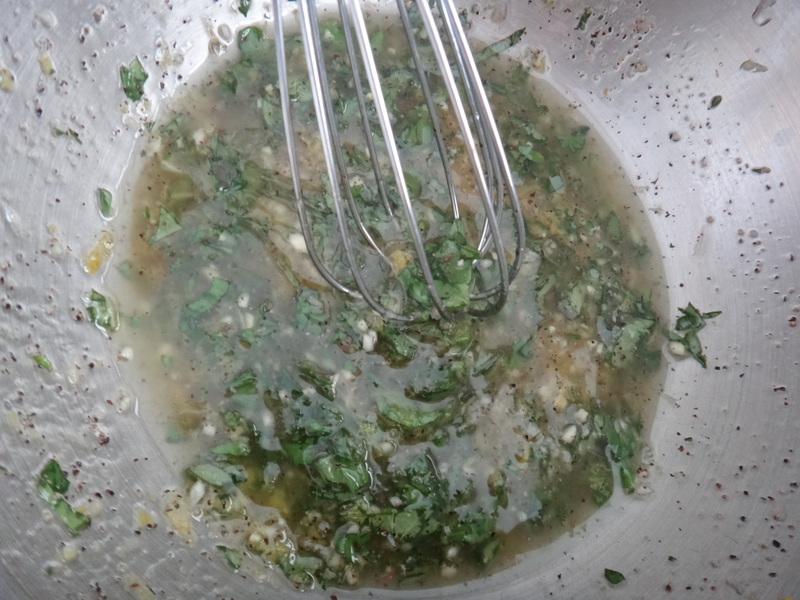 Add the pasta water to the dressing and whisk until smooth. Meanwhile, use a medium sized skillet to heat 1 tbsp of olive oil over medium heat. Add the chopped onions, carrots, mushrooms and garlic. Sauté until the mushrooms reduce in size and the onions become transparent. 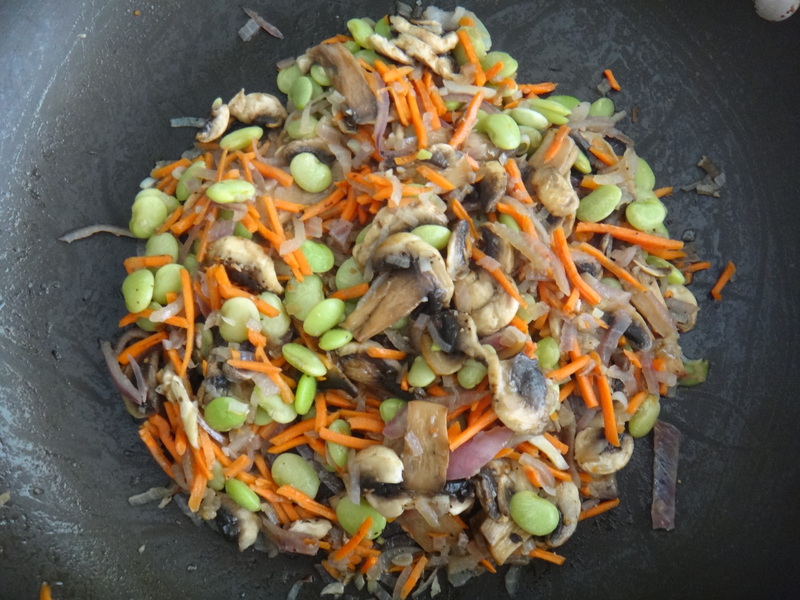 Add the lima beans and 1/4 cup of water to the vegetables to help caramelize and cook them thoroughly. This should take 5-7 min. When cooked, set aside the skillet. Pour the cooked pasta over the vegetables. Add the salad dressing and toss until well coated. Add the almonds and parmesan cheese. Toss again. Optional garnish: chopped fresh basil on top. Serve or store and enjoy! 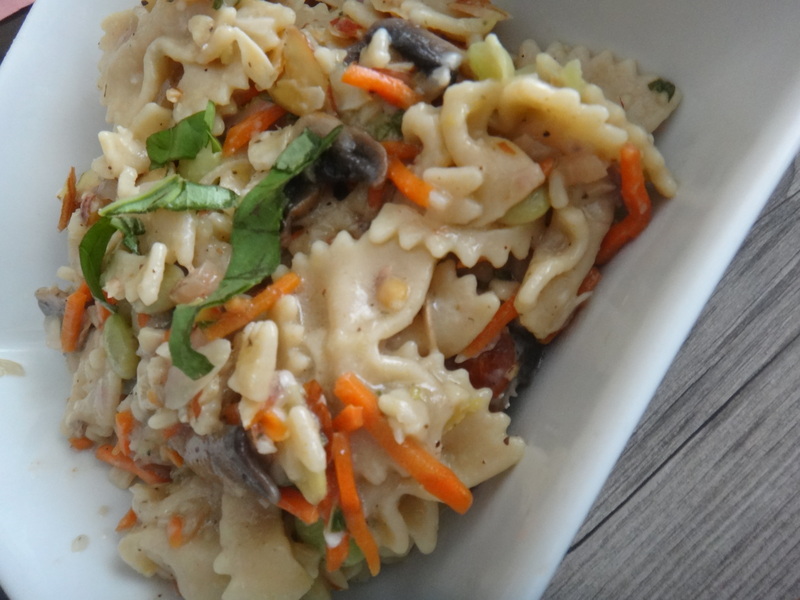 … What kinds of vegetables do you use in your pastas? Truly inspired!! 🙂 I have a question, could you do a recipe for low fat bread? Or tortillas? I have this new infatuation with the stuff, and I’m trying to “healthy-fy” it. So a little help would be much appreciated! Looking forward for the next entry! Oh Andy…how you think highly of me…Making bread is a tough task. I once tried to make focaccia bread but was to impatient because it usually can take from 12-14hrs due to the time allotted for the bread to rise…. But if I find a recipe I will be sure to share it with you! Hola! soy la prima de tu papi. Me encanta tu blog y lo voy a seguir. si tienes preguntas o dudas sobre un plato Italiano, let me know. La cocina Italiana es mi especialidad! Muchas gracias por el apoyo! Es bueno saber que cuento con una experta!